If there's one thing my kitchen garden does really well, it's grow herbs. Like clockwork, thyme blooms around the summer solstice, sending up charming little columns of flowers that seem to last for weeks. To eat, these blooms are somewhat milder than the leaves, tender and sweet, with light tannic notes (thyme is, after all, a woody herb) and a hint of licorice. In April, Caledonia Spirits released a limited run of its Barr Hill Reserve Tom Cat gin, which was aged in Vermont white oak barrels made by a cooper outside of Plattsburgh. On my way through Hardwick earlier this month, I stopped at the distillery and snapped up a bottle. It's a sipping gin — golden in color, smooth and honey-sweet with herbal, woody and nut-brown flavors that you can unpack for hours. I like to savor a liquor this good (and in a bottle so small — just 375 ml! ), so I use it sparingly in cocktails. 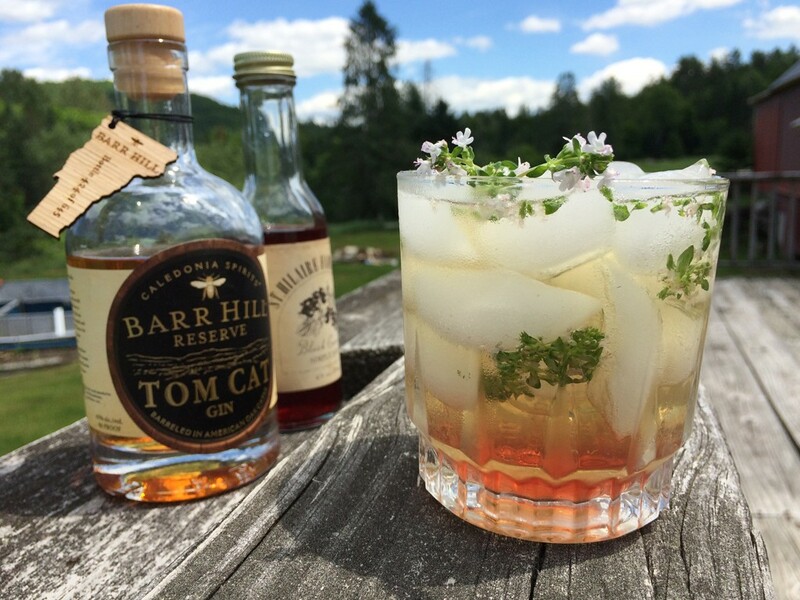 But, muddled with English thyme flowers and topped with tonic, Tom Cat makes for a refined spin on a classic. It's a cocktail that suggests fresh herbs at first sip, and then the liquor's woody, whiskey-sweet flavors take over. I also added a few drops of black currant simple syrup from St. Hilaire Family Farm (available at Burlington Farmers Market and City Market/Onion River Co-op). Since it's officially summer now! Pour a shot of aged gin in a rocks glass. Remove thyme flowers from stems and add to the liquor. Muddle with a wooden spoon or pestle. Fill glass with ice; pour tonic to fill; stir gently. If you feel like it, add a floater of black currant or berry simple syrup or a squeeze of lemon or lime. Let's Drink to Rhubarb Season!